What is measured energetically is not always manifested or visible in the physical body, and some disturbances that are manifested are not measurable. So a statement as to whether someone does or does not have a disease has no place in Biontology sessions. The aim of this treatment is to release energetic blockages and disturbances in the body to restore its self-healing capacity. However, after seeing many clients, Biontologists often start to recognize patterns and correlations. This allows them to share a personal interpretation of what might be causitive in a disease, which can be very accurate. Johan Boswinkel has proven this many times in the past. When sharing these interpretations, it should always be known to the client that they are not diagnoses. During the full session, which typically lasts an hour or more, the practitioner is with you in the room. Observation and conversation are an important part of Biontology. Apart from the biofeedback treatment with the body’s own light, the Biontologist uses no other means to manipulate the physical or energetic body. No supplements, (medical) drugs, homeopathic remedies, crystals, energetic devices, spiritual healing, other therapies etc. are added, since they will all just interfere with the body’s own course of healing initiated by the light treatment, and delay or even block results. Providing there’s no interference of other physical or energetic treatment (see previous section) or environmental disturbances, a client typically needs 4-12 sessions to completely restore biophoton coherence. Usually results are experienced very soon after starting the therapy. If there’s no change in symptoms within four sessions (or eight sessions in cases where heavy medication is used) it is advised to look for another practitioner. The first 2 treatments should be no less then 3 and no more then 5 days apart. After this, the frequency is no more than once per week. 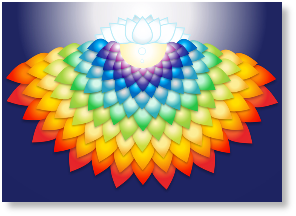 The sessions are there to initiate the self-healing action. For the healing itself, the body needs time and rest. This is why the break between sessions is as important as the session itself. Treatment more then once weekly might overburden the body and delay healing. The practitioner will first assess whether there’s any reason not to start a biophoton treatment. Then a short interview follows to get a general picture of the imbalances experienced by the client. 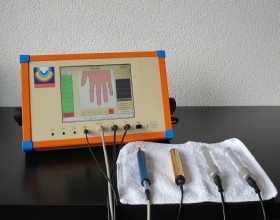 Skin resistance measurement is first performed on several points on the hands to establish whetherwhiplash or a condition that’s referred to as electron spin-inversion is present. When these conditions are found the client is treated for them first. The practitioner will explain what environmental causes there might be for the spin-inversion and how it can be prevented or corrected in the future. After this, all points on each finger and toe of both hands and feet are measured to get an overall picture of what organ systems are affected energetically. Now, informational remedies are tested that might balance the body out. This involves testing (measuring on the points) for every remedy that is chosen by the practitioner and added to the list in the Chiren. A treatment with glass rods in both hands is carried out. After the hand treatment, another measurement follows, and if necessary new remedies are tested. Finally, two glass plates are placed underneath the feet to run a program that takes about 17 minutes. Children under 12 usually don’t get a footplate treatment, but sometimes a second short hand treatment is given if necessary. After the footplate treatment another measurement is carried out, which is the final check-up.